With the holidays just around the corner, we know some of you might want to dig into your digital marketing, even while we're celebrating the holidays with family and friends. That's why we blog and provide free webinars, availble 24/7. #GivingTuesday is a global day of giving fueled by the power of social media and collaboration. Celebrated on the Tuesday following Thanksgiving (in the U.S.) and the widely recognized shopping events Black Friday and Cyber Monday, #GivingTuesday kicks off the charitable season, when many focus on their holiday and end-of-year giving. 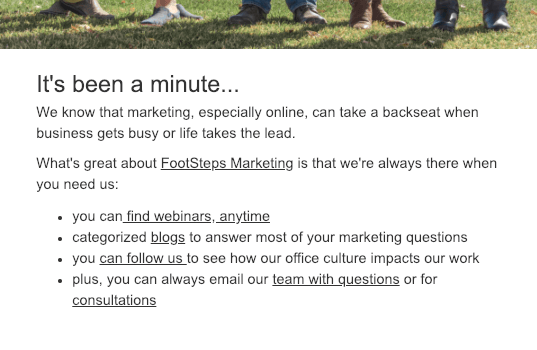 Learn about some of our client's giving practices and about FootSteps Marketing's corporate practices, too. It's the busiest time of year for America's retailers and while online shopping is convenient, we at FootSteps Marketing truly believe in the power of your brick and mortar storefront. We've compiled some sweet tips that, in coordination with your digital marketing efforts, will help drive footsteps through your doors. Get a Bad Review Online? Brush It Off! Negative reviews are not necessarily the worst thing, but your reaction to them might be. If you take a step back, you'll find they can actually make the positive reviews stand out and help you improve your company culture. Follow these steps to responding to negative online reviews and brush it off.